Korean electronics manufacturer Dongbu Daewoo has introduced the Classe Cube, a refrigerator which includes NFC technology provided by STMicroelectronics. 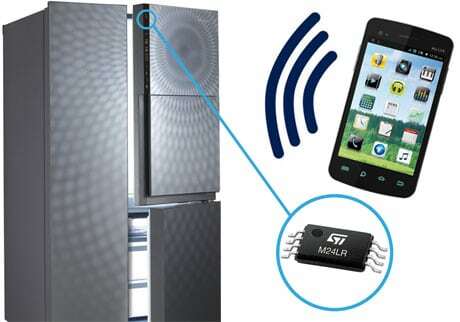 A built-in M24LR dynamic NFC/RFID tag collects and transfers sensor data from the fridge to an app on the user’s smartphone. The Classe Smart app reports on the temperature in different sections of the fridge and can also send diagnostic information back to the manufacturer. “Integration of NFC technologies increases the intelligence of home appliances that results in higher customer satisfaction,” says YS Jeon, director of Dongbu Daewoo’s refrigerator division. “We are excited to offer products and technologies that increase convenience and advance the adoption of wireless technologies in digital home appliances with the integration of our market-unique NFC/RFID-enabled M24LR memory device in Korea’s first NFC fridge,” adds STMicro’s Benoit Rodrigues.